The Hall Art Foundation is pleased to announce an exhibition of work by the internationally acclaimed German artist Candida Höfer to be held at its Schloss Derneburg location. The exhibition will include 15 of Höfer’s monumental color photographs. Candida Höfer is known for making carefully composed large-format color photographs that methodically document institutional spaces devoid of people. The locations she chooses are always rich in human history and have included cultural institutions (museums, libraries, national archives) and public buildings (places of worship, opera houses) that are typically filled with visitors. Her works are produced without digital enhancement or alteration, using long exposure and working solely with the existing light source. 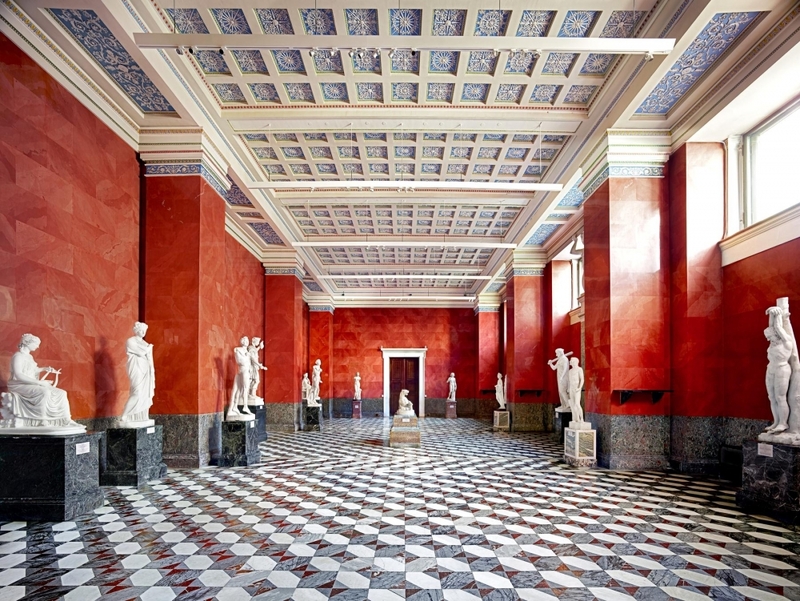 Höfer has photographed museum spaces around the world. In the summer of 2014, she was invited to photograph a number of palaces, opera houses, libraries, museums and theaters in and around St. Petersburg, Russia, including the State Hermitage Museum and Catherine Palace. In works from her “Russia series”, such as Hermitage St. Petersburg VIII 2014, Höfer presents an idealized view of a gallery built to preserve and celebrate a rich cultural heritage, but also to impress in its splendor. In works from her “Louvre” series, such as Musée du Louvre Paris XXI 2005, Höfer presents the luxurious galleries of this world-famous museum, normally experienced by visitors filled with other members of the public, totally emptied. In 2012, Höfer was commissioned to take a series of photographs of the Villa Borghese in Rome. Galleria Borghese houses the vast collection assembled by the Borghese family in the 17th century of old master paintings, Roman sculpture and classical antiquities. The statues raised on blue plinths, as can be seen in Villa Borghese Roma I 2012, form part of the Galleria's rich and complex history. First owned by the Borghese family, these sculptures were sold to the Louvre under duress in 1807, but lent back to the Galleria for an exhibition in 2012 where they were presented in their original setting and photographed by Höfer. Finally, in response to Schloss Derneburg’s ecclesiastical history, photographs taken by Höfer of spaces of worship in Portugal will also be in view. Basilica do Palàcio Nacional de Mafra III 2006 presents a view of the palace-monastery’s sumptuous Baroque basilica from the elevation of its barrel vault.